A native of Broken Bow, Nebraska, Josey Evans grew up hearing his uncle talk about his work as a nurse anesthetist in western Nebraska. Evans liked the idea of a career that allowed him to help people with healthcare in their own home town. Josey Evans of Broken Bow, Nebraska, will graduate in December with a bachelor of arts degree in health systems from Hastings College and a bachelor of science in nursing degree from Creighton University’s College of Nursing. Evans said he credits his college advisor, Dr. Amy Morris, professor of biology and chair of the department at Hastings College, for helping him create an academic plan to meet his career goal. After 12 months of intense academic and clinical course work, Evans will graduate in December with a bachelor of arts degree in health systems from Hastings College and a bachelor of science in nursing degree from Creighton University’s College of Nursing. The 3+1 nursing program is a partnership between Hastings College, Creighton University College of Nursing and Mary Lanning Healthcare. Evans said he plans to work in a large hospital setting for a couple of years to gain experience before he returns to establish a career “somewhere in the [sand]hills” of Nebraska. 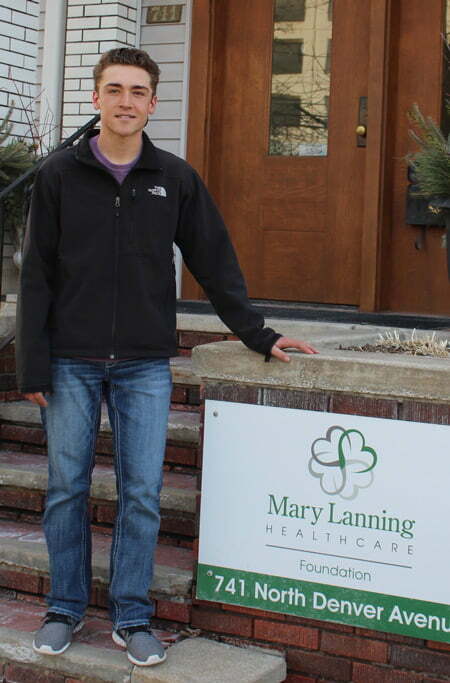 Evans was recently awarded a Lunstra Memorial Scholarship, which is administered by the Mary Lanning HealthCare Foundation. Sharon Hayek, who chairs the selection committee for the scholarship, recognized Evan’s excellent academic record and his ambition to accomplish so much in just three-and-a-half years. “Excellent nurses are and will continue to be in great demand, especially those with outstanding academic and clinical training performance, like Josey. We were so pleased to learn he wants to practice in rural Nebraska,” Hayek said. Dr. Donald Lunstra and sons, Christopher and Dustin, established the Vickie Hughes Lunstra Memorial Scholarship Fund in October 2009 to provide financial assistance to nursing students in honor of Lunstra’s wife and the boys’ mother. With help from the Mary Lanning HealthCare Foundation, Lunstra created the scholarship, which stipulates applicants be considered based on their outgoing personality (similar to his late wife’s), financial need and intent to practice nursing at Mary Lanning Healthcare or in Nebraska. A version of this story originally appeared in a Mary Lanning HealthCare Foundation newsletter and their website.